In this project, the size of the boards really do not matter, the post in mine is about 6 inch long about 2 in wide and about ¾ inch thick. Whatever scrap you have lying around will work perfectly fine, just make sure your scrap has parallel sides and is cleaned up and ready to work with. I started by cutting mine to whatever length looked good using a hand saw at the bench. I used a mortising gauge to lay out the thickness of the mortise. This should be the same width as the beam material you want to use. In my case, the beam was a ¼ in wide so my mortise needs to be a ¼ in wide and it needs to be cut about a ½ inch shallower than the width of your beam. In this case, my beam is 2 ½ inches wide so I cut the mortise to in deep. 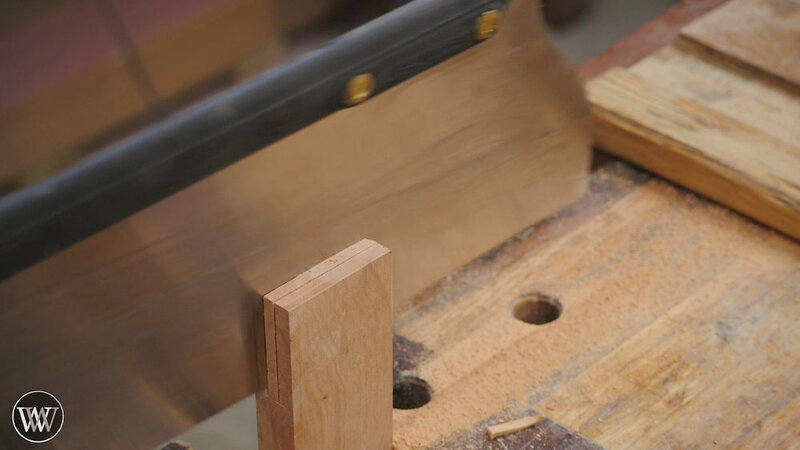 I used a hand saw to cut down either side of the cheeks of the mortise and then removed the waste with a chisel. The beam can also be out of any material or scrap you have lying around, but it is best if the beam is ⅓ of the width of your post. In this case, mine was from a scrap of ¼ inch thick white oak. I made it about a foot long and 2 ½ in wide. If you're looking for simple, then you can just leave it rectangular but I wanted to add a little bit of decoration to my Square. To do so, I cut a 45 degree cut on one end and a stair step on the other end. This stair step can be used for quickly laying out lines at ¼ inch, ½ inch, and ¾ inch increments, though most people just leave it a ¼ inch longer than the post. The inside of the square should be perfect as it was checked before gluing with another square or with using the line trick on a straight board. But, if the two edges of the beam are not perfectly parallel, the outside will be out of square. Also, because the square is made of wood, it will have a tendency to move a little bit over time. So, I will use the line trick on a straight board to check and see if the outside of the square is indeed Square. To adjust it, I can use a plane and start at the end of the beam that is too high and take off a little bit on that end and then slowly move the plane back along the board taking off longer and longer strokes until I get one nice pass from end to end of the beam. This will take off more material on one end than the other and taper it from one end to the other. Then I can take it back to that board and test to see if it is square. Just repeat the process until it is within tolerance. Once the glue has dried, I cleaned up any squeezed out glue with a card scraper and chisel and then do any small finishing and smoothing I want to do before applying finish. For the finish on this, I chose boiled linseed oil and paste wax. I love the way it feels in the hand and it brings out the color of the White Oak in the Cherry like nothing else. It is also a very easy finish to apply, the boiled linseed oil just goes on to the wood until the wood stops absorbing it, then wipe off the excess and apply paste wax. The whole process can take less than an hour and leaves a finish that is fantastic to the touch and will last a good while.